Cases are often referred by business attorneys, real estate attorneys, intellectual property attorneys or law firm attorneys with a conflict. A client may need to file or defend a civil action. A bullying opponent may have sent a demand letter, a contract may have been breached, property rights may have been infringed. Fast analysis and response to a case can create big advantages in moving toward resolution. Aggressive pleading, continuing with well-organized discovery, and ending with clear trial presentation, makes for favorable results and happy clients. Having a trial lawyer available increases the power of the transaction lawyer to arrange for complete service for clients. Repeated referrals are common, because of the results obtained. 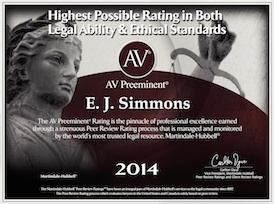 Mr. Simmons has been serving as a litigation department for other lawyers for years. – Emphasizes starting with a winning strategy. The first step is a brief telephone conference, to find out some basic information. What do you need, who referred you, when is action needed. This is often followed by sending you a short document with some big points for your consideration. Next will be a meeting, usually about an hour in my office, so that we can develop some detail about what to do. To set up your brief telephone conversation, click the button below. You are welcome to review this site’s information on how your trial matter would be handled. Make sure you get the free report, “How to do Economical In-House Focus Group Research and Practice Trials”. Learn about typical clients, by clicking here. Simmons Trial Practice handles business litigation cases, and has a separate web site if you need a personal injury attorney. Moreover, there is a website with emphasis on electrical accident cases.